The SL Naturist Office at Eden, Issuu and other news. I hope Brenda, who offered office space to Ella at Eden Naturopolis, doesn’t mind us moving into that SL Naturist office. 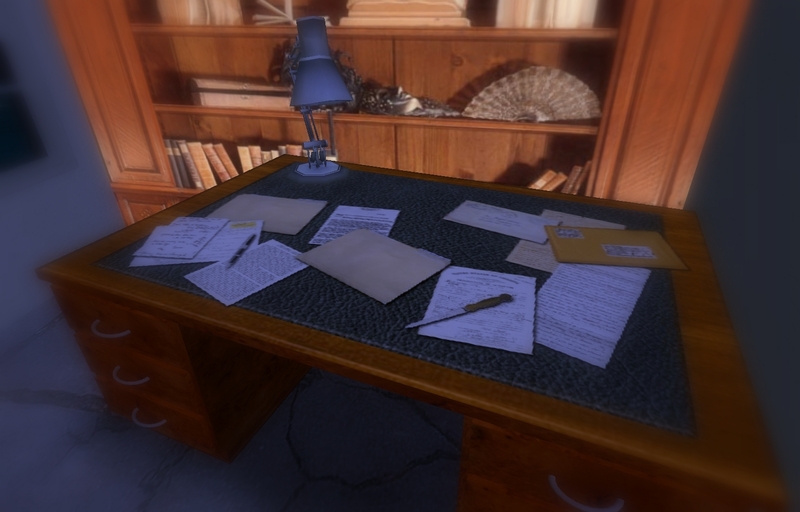 As you can seen, the desk’s already full of correspondence and plans. Now that I’m beginning to establish a SL Naturist routine, I can now turn my attentions to how to move forward with it. I’m still discovering bits of it day by day, including previous publications via the online magazine publishing house, Issuu. This facility seems underused. That’s not a criticism of our predecessors by the way. The number of posts they created seems like the main blog kept them busy. But having discovered Issuu, I would be planning to try to use it some more, and plans are already underway to add to our collection of titles, with the seventh publication making an appearance before Christmas. Well before Christmas, ideally, before the SL world is overtaken by wintry scenes. It’s not coincidental that my plans to utilise the Issuu service are accompanied here by a photograph of the SL Naturist office. I think it’s fair to say that in terms of size and scope, Eden Naturopolis is the prime naturist sim in Second Life and I’d like to dedicate a full Issuu publication to Eden and attempt to convey the full breadth of the place. Not only will I be covering much of the facilities at Eden, but also its associated semi standalone sims. By that I mean Blue Lagoon, Naked Dreams, Bumrose, and anywhere else I come across in the meantime. What I do intend to do is to try and make a regular presence at the Eden lighthouse office, probably some time over weekends, in future. Not this weekend and perhaps not this year, but certainly by the beginning of 2016 my plan would be to be at the lighthouse office for a specific period on a specific day (real life permitting) every week so that people can stop by and say hello if they wish to do so.